Air Hockey is one of the most loved arcade pastimes in the world, and ever since the game was invented it has become one of the most enjoyable indoor games for young and old. As you know, air hockey is a game played by two players standing at opposite ends of a rectangular table. Each side of the table has a hole—or a goal—into which players attempt to sink a lightweight puck that is seemingly suspended just above the table by thousands of tiny holes blowing air. The game is very fast-paced and it is even played at the very highest levels among those who are the very best in the game. But what if you are all alone? Can you still play a game of air hockey? The answer to that question is yes. 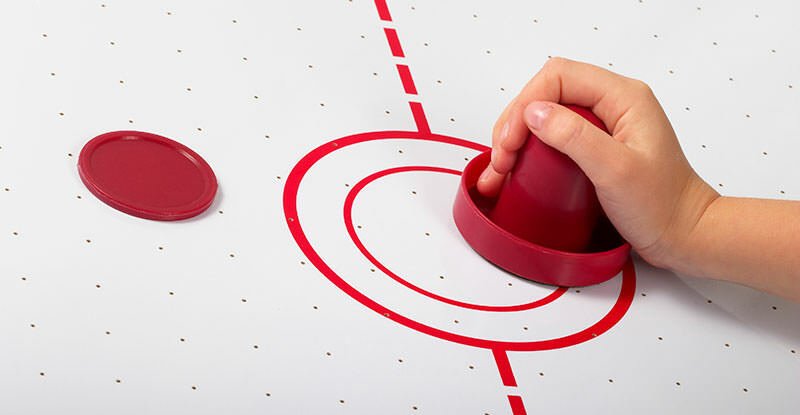 While you cannot exactly play a regulation game of air hockey by yourself, you can practice many of the skills involved in the game, even without a partner. In this article we have outlined several tips and strategies for playing air hockey by yourself—tips that will help improve your game and make you ultra ready for the next time you play with a partner. If you have ever played air hockey before, chances are you gave no real thought to holding the paddle, or more specifically, how to hold the paddle in the correct way. Did you even know there was a right and a wrong way to hold the paddle? Maybe not, right? Well, there is. Holding the paddle correctly in air hockey is one of the most basic skills to learn. It is also the skill that can have the biggest impact on your success and failure, and one that can be practiced when you are all by yourself. The air hockey paddle, also known as an air hockey mallet, is a rounded disk with a raised handle that is rounded off on top. Because of this shape, most beginner players tend to grab this rounded-off portion from the top with the palm of their hand, or grab it with their palm to the side. And while this might feel like the most comfortable or natural way to grab the paddle, this grip is called improper by those in the know, largely because it does not lend itself to speed and accuracy when attacking the puck. Pull up a video on YouTube between experts players and you will see what we mean. If you watch professional air hockey players (yes, they do exist), you will notice that they tend to grip the paddle by bending their middle finger and placing it behind the back of the paddle. They then place their forefinger and ring finger on either side of the paddle, leaving their thumb and pinky finger off the paddle entirely. This grip is designed to control the action of the puck, but if you’re picturing this grip in your mind you may be thinking that this sounds a bit uncomfortable. Not really—once you get used to it. However, if this sounds a bit too technical for you there is actually another way: try holding the paddle with all four fingers, placed in the rim of the paddle to the back and side. By not holding the paddle with your palm you allow for greater wrist action, increased control and much faster shots. Developing a positive grip on the air hockey paddle is certainly a skill you can practice by yourself. It may look funny to your playing partner the next time you have a real match, but once they see how successful you are with it chances are they will be begging you ro show them how it’s done. When playing air hockey by yourself you cannot really practice your defensive strategy. Of course, you can slam the puck to one side and practice blocking it before it goes into your goal, but because you will always know where the puck is going this is going to get boring pretty quickly. Fortunately, there are other skills you CAN practice when you are alone, including your shots. In air hockey there are many different types of shots, all of which can be practiced when you are by yourself. And once you learn these shots your playing partner is going to be amazed. In the game of air hockey, there are a many shot types that you can practice in order to become very proficient at the game. The two most important of these is the straight shot and the bank shot. Once you have completely mastered the skills needed to consistently make these two basic shots you will be very hard to beat. What’s more, by becoming capable at the straight shot and bank shot, you will then be able to add in other offensive moves to your air hockey toolbox, including jukes, fakes, misdirection shots and drift shots—a strategy in which you lull your opponent to sleep by lightly tapping the puck away from your own goal zone, and follow that soft shot up with a slam shot that will catch your opponent off guard. Here are some of the basics associated with both the straight shot and the bank shot—fundamentals you can practice on your own to become much more skilled. Of course, in air hockey the straight-on shot is one of the easiest of all the shots to learn. However, it is not quite as easy and straightforward as you might think. A perfectly timed straight shot is an amazing weapon that can help you take advantage of an opponent who is out of position. In many ways the straight shot is a tricky shot, given that most air hockey pucks tend to move in an angled fashion due to the rectangular-shape of the table. As such, the straight shot can be a difficult one to master. However, once you practice and become proficient with the straight shot, you can start showing up even the better players who tend to over-commit to a big shot. To work on your straight shot, start by positioning the puck in the center of the table. Next, grip the paddle in one of the two ways we suggested above—whichever one of the two is most comfortable for you. Position your paddle about 4 inches behind the puck and briefly line it up with the goal on the other side of the table with your eyes. This is the last time you are going to look up until you make contact with the puck. Most players tend to look up before making contact with the puck. Because of this, they hit it off-center and the puck goes diagonally. Instead, look at the back-middle portion of the puck all the way through contact. Continue practicing this skill until you can make the straight at least 7 out of every 9 tries, and then move the puck to a different position on the rink and repeat this process. The bank shot, interestingly, is much more common in air hockey than the straight shot. Bank shots come in a number of different forms and types, but regardless of the type of bank shot you hit, the goal should always be to strike the back portion of the puck rather than the side of the puck. When a puck is struck from the side, it becomes far more likely that you will hit a double or triple bank shot. These types of bank shots tend to slow up when they reach the goal, and are thus easier to block. Shots hit behind the puck, however, tend to go faster and will bank only once before entering the goal. According to some of the masters of the game, there are two types of bank shots you can practice to really improve your game: the “over bank shot” and the “under bank shot.” Practicing either of these shots does not require a lot of skill, but they do call for a lot of concentration. When hitting the over bank shot, you should start the shot by striking the back of the puck against one of the side rails on your side of the table. By doing this, the goal is to create a bank shot that goes “over” your opponent’s paddle when he or she is closely guarding the goal. With the under bank shot, you will want to begin the shot by again hitting the back portion of the puck. Only this time, you will want to aim the puck for one of the rails on your opponent’s side of the table. This will generate a sharp-angled shot that will go “under” your opponent’s paddle when he or she is guarding too far away from the goal. In short, when the goal is being closely guarded, choose the over bank shot, and when your opponent has his or her paddle away from the goal, choose the under bank shot. Both of these shots, when practiced regularly, can help you improve your game dramatically and run up the score on any opponent you play.